Whilst I am a young earth creationist at heart, I cannot bring myself to condone some of the things done in this story by those with whom I would ordinarily stand shoulder to shoulder. It's also testimony to the fact that in some parts of America, Christianity is more closely tied to a misplaced sense of nationalism than to Christ. It makes for very provocative viewing for people like me and is helpful if you, like me, want to get rid of the unhelpful straw men, clichés and sloganeering that are so often thrown up by both sides in this debate and to clarify in your head and heart what the real issues are; what is and isn't to be defended or propagated. This morning, (Saturday) my bible reading plan landed me in 1 Cor 4. I know the context is not ID, but it was helpful to me. The issue is not can I get my head around everything, I can't. My head would explode. But my first priority is to humble myself before the living God for their assessment, not mine or anyone else's. Richard, I have just finished watching the ID programme. Some initial thoughts. 1. The house on the sand fell flat! Intelligent designers have tried to separate creation science from God in order to fit in with the American constitution. This led them to lie and perjure themselves in court. They have brought creation science into disrepute as a consequence. The actions described of hate mail/death-threats are indefensible. Unless we build upon the rock our house will fall flat. 2. It is the role of the CHURCH to counter evolution. We should not be expecting the secular world to do our job. 3. The natural bias of the documentary did overstate the case for evolution. So-called link fossils are extremely rare and are by no means indisputable. The 2004 fossil was incomplete and required considerable artistic interpretation in its reconstruction. All the images of dinosaurs we are presented with are similarly constructed, most from only a few bone fragments. The same is true of anthropology- ‘Lucy’ being a prime example. 4. The apparent destruction of the irreducible complexity issue was particularly weak. All they proved was that two bacteria looked similar and were made of similar stuff. It certainly did not show that one had evolved from another. 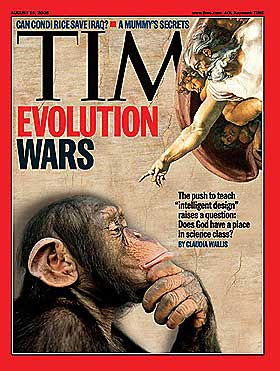 This issue is best illustrated when creationists and evolutionist engage in a live fair debate rather than in the confines of a court case where the defence are trying to hide the fact that they have Christian influence. 5. Creation scientists and evolutionist scientists are both searching for truth. Their conclusions are logically based on their observations and interpretations. However, they start with very different basic assumptions. The true test is which conclusions match the evidence best. To illustrate the point the 2004 fossil was found in rocks presumed to be of a certain age. So the basic assumption is that the scientists know the age of the rock. This is a fundamental difference between creationists and evolutionists. I am still convinced that evolution is faulty science and that the earth is relatively young.